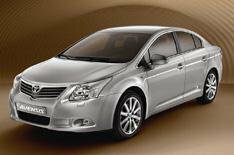 Prices announced for new Toyota Avensis | What Car? Toyota has revealed prices for the new Avensis, which will arrive in UK showrooms on January 1. The new Avensis starts at 15,670 for a 145bhp 1.8-litre saloon in base T2 trim, and rises to 24,570 for the 175bhp 2.2-litre turbodiesel version in T Spirit spec. The estate is 980 more expensive than the saloon across the T2 spec, while a new CVT transmission, named Multitronic S, is available for petrol-engined cars. Multitronic S will also cost 980. A conventional six-speed automatic gearbox will be available on diesel-engined models towards the end of 2009. The saloon and estate version of the new Avensis will be available from launch.